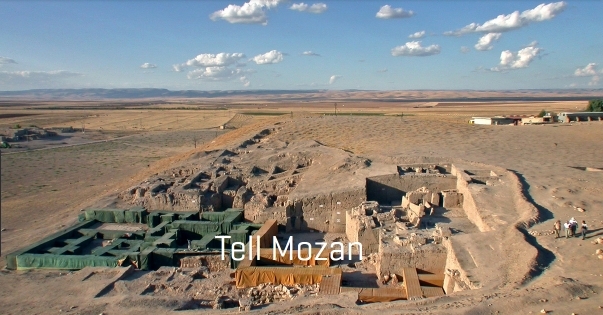 Archaeologists excavating Tell Mozan have been mindful of preserving the site for the long term. However, the encroachment of a nearby settlement threatened the site, prompting a successful nomination to the 2006 World Monuments Watch. The attention the Watch created for Urkesh led to the formal establishment of a park area enclosing the archaeological boundaries of the site. The archaeologists have always strived to integrate conservation into excavation work, and as a result of this approach they have been able to prevent the rapid deterioration that often plagues newly excavated archaeological sites, and to avoid the need for heavy physical intervention. Over many years, the archaeologists have designed and perfected a simple and lightweight system of shelters that protect the ancient mud-brick walls from heavy rain and wind. Metal frames covered with mud roofs on top and synthetic fabric or burlap on the sides enclose the excavated wall sections, and also recreate the original sense of space with their volume. In 2009, WMF sponsored an initiative to expand this unique site protection technique and to improve interpretation, within a well-established strategy for long-term stewardship.